Chester County’s Department of Drug & Alcohol Services is spreading community awareness for National Prescription Drug Take Back Day taking place this Saturday, October 22nd. Organized nationwide by the Drug Enforcement Administration (DEA), National Prescription Drug Take Back Day provides local sites for safe, convenient and responsible means of disposing of prescription drugs, while educating the public about the potential for abuse of medications. 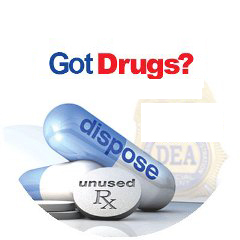 From 10:00 a.m. to 2:00 p.m. on Saturday, October 22nd, prescription drug disposal sites will be set up throughout Chester County in locations including Avondale, Berwyn, Coatesville, Devon, Downingtown, Kennett Square, Malvern, Phoenixville and West Grove. Find a location near you. Prescription drug abuse is an ever-growing epidemic not only in Chester County, but across the nation. Commonly abused prescription drugs fall into three different categories which include opioids, which are pain relievers and have a similar chemical make up as heroin; sedatives, which are used to treat anxiety and depression; and stimulants, which increase attention, energy, blood pressure, heart rate and breathing rate. According to the Substance Abuse and Mental Health Services Administration, it is estimated that between 26.4 million and 36 million people abuse opioids worldwide, with an estimated 2.1 million people in the United States suffering from substance use disorders related to prescription opioid pain relievers in 2012, and an estimated 467,000 addicted to heroin. The Chester County Department of Drug and Alcohol Services in partnership with the Chester County District Attorneys’ Office, Chester County Health Department, and several other county departments and community partners are dedicated to spreading awareness, education and prevention messages surrounding prescription drug abuse. Chester County will be holding its first Color 5K run and walk in West Chester on Saturday, November 5, 2016 to raise awareness and funds for the fight against opioid and heroin addiction. For more information, visit http://chesco.org/color5k.